Kingston Black, Ellis Bitter, Tremletts Bitter, Browns, Somerset Redstreak and Major; those in the know will recognise these as varieties of cider apple trees. All can be found in Zoë Marshall’s 10 acre orchard in Netherhay, which she has planted and nurtured alongside her Garden Designer husband, Duncan. Together they shared a dream and bought a field in 2001 wanting something for their future. Now the couple are ready to share the fruits of their labour under the apt name of The Gardener’s Orchard. Always intended to be a cyclical enterprise, the orchard works for itself. Sheep graze under the boughs, horses munch the hay, the trees benefit from the horse manure and chickens wander round pecking away, scratching at the weeds. As for the fruit, this is transformed into traditional farmhouse cider, which in turn is used to make cider cake. 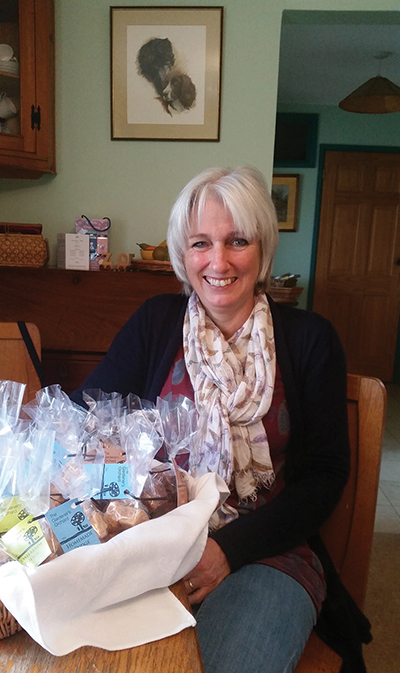 Zoë uses her family’s secret recipe to make speciality fudge and sells it, with the cider cake and cider, at local stores, fairs and markets, as well as through their website. Zoë grew up on a farm near Crewkerne. She has idyllic memories of hauling bales and riding around on a tractor, sat next to her father. Working for years as a farm secretary, she met Duncan at agricultural college. Zoë maintains strong links with the farming community, still working one day a week for a local farming family. She helps Duncan with his garden design business and makes fudge or cake two days a week. The couple work together in their orchard, all while raising their two girls, who have just about flown the nest. Now, Zoë is happy doing what she loves every day, and by her side, is the man who declares he “knew within two seconds, she was the woman” for him. In amongst the cider, cake and fudge emerges a true love story.